When Gulliam Le Floch, the French exchange student came to live with us in August 2014, we visited the Mennonite community in the St Jacobs Village in the Waterloo Region of Ontario. The aim of the visit was to introduce Gulliam to the Canadian culture and the people. Mennonite is a Christian group, by the name of Anabaptists, who took their name from their Dutch founder, Menno Simons. They believe that they are to follow the mission and ministry of Jesus Christ, which they held onto firmly despite being persecuted by various Roman Catholic and Protestant states. They are known as people of Peace Churches as they would rather flee a country than fight for their rights, or be forced to fight for that country, as they are committed to non-violence. Hence they do not join the armed forces or the police. Today, there are 1,500,000 Mennonites around the world and there are congregations world-wide with large populations in Canada, the United States and Mexico. Mennonites are recognizable by the way they live and dress, with many living the way their fore-fathers did. They have rejected the use of modern technology and motorised transportation and have succeeded in continuing a traditional farming style. 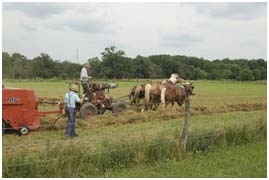 Most use tractors and mechanized equipment, though a few very conservative Mennonites use a horse. Driver’s licenses are forbidden, though motorized transportation may be hired for longer distances. Most Mennonites have telephones, running water and electricity and use freezers and washing machines but not dryers. The community allows for two phones per family, but without accessories on the phones. They do not use cellular phones, fax machines, computers, television, or radios. They accept neither health care nor education paid by the state. Their children are reportedly doing well in mathematics as they do not use calculators and cellphones. They are considered hard working, thrifty and industrious, and live a rural, agricultural life-style and are often seen in local markets selling their home-baked pies, fresh eggs and home-grown vegetables. The men wear plain trousers and jackets, and often a plain straw hat and women wear their hair long, but covered by a prayer cap and have plain dresses, often dark navy blue, brown or black. The overall impression is one of simplicity and plainness, which is their aim. 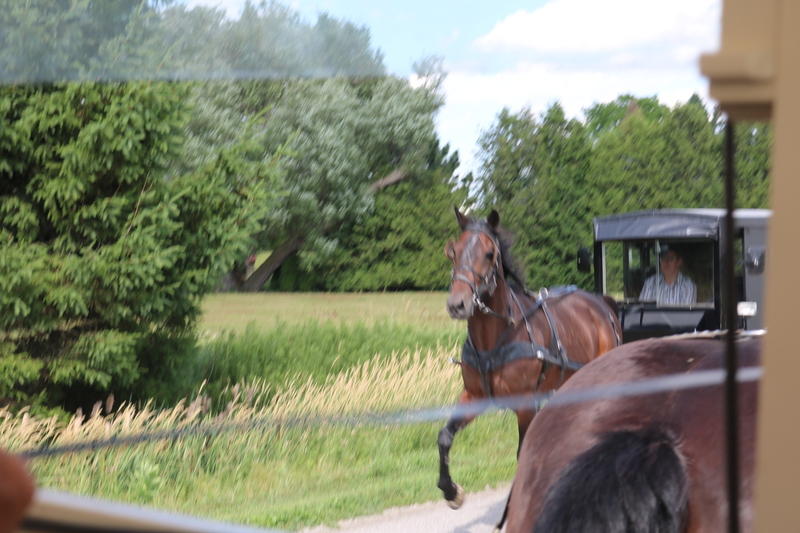 On the roads of St Jacobs, you can find them in their horse drawn buggies as they go about their daily lives. They often choose to educate their children in schools they run themselves, as this ensures that their beliefs and values are passed on to the next generation, which is probably the reason for their continued growth and success. The Mennonite children are baptised in their late teens when they accept to live as a member of the community, accepting the Mennoite way of life. Those wishing to leave the community for better educational or career objectives are allowed to leave. Due to their emphasis on the virtues of thrift, diligence, frugality, and humility, Mennonites learned to earn a living on the poorest soils to where persecution often drove them. They learned to improve the fertility of poor soil and experiment with new ways of farming. Over the centuries, they developed both skills and a reputation as expert farmers. In Canada, the Mennonites took to maple syrup production in a big way. Maple syrup is often eaten with pancakes, waffles, French toast, or oatmeal and porridge. It is also used as an ingredient in baking and as a sweetener or flavouring agent. Culinary experts have praised its unique flavour, although the chemistry responsible is not fully understood. Maple syrup is also used in specialty products such as maple butter and candies. Canada has a large number of sugar maple trees. Canadian national arboreal emblem is the maple tree showing Canada as a world leader in sustainable forest management. The Canadian flag is red and white, with a stylized eleven-point maple leaf at its centre. The sugar maple trees are tapped in the spring to extract the sap of the trees. Each fall, the maple trees shed all their leaves and also produce starch that helps protect their roots from freezing during winter. The trees then convert this stored starch into sugar. When the snow melts, water penetrates the roots and mixes with this sugar to produce sugared watery sap. During the warm spring days, this sap moves up the tree to the buds in preparation for the growing season. During the cold nights, the sap moves down to the roots to avoid freezing. The spring thaw causes the wood of the tree to expand, which puts the sap in the wood under pressure. This movement of the sap lasts for about three weeks, until the tree’s buds leaf out, generally from March to April. During this period of spring of warm days and cold nights, the sap is extracted through a hole drilled into the wood. The holes are connected with a pipeline ending at the collection tank. 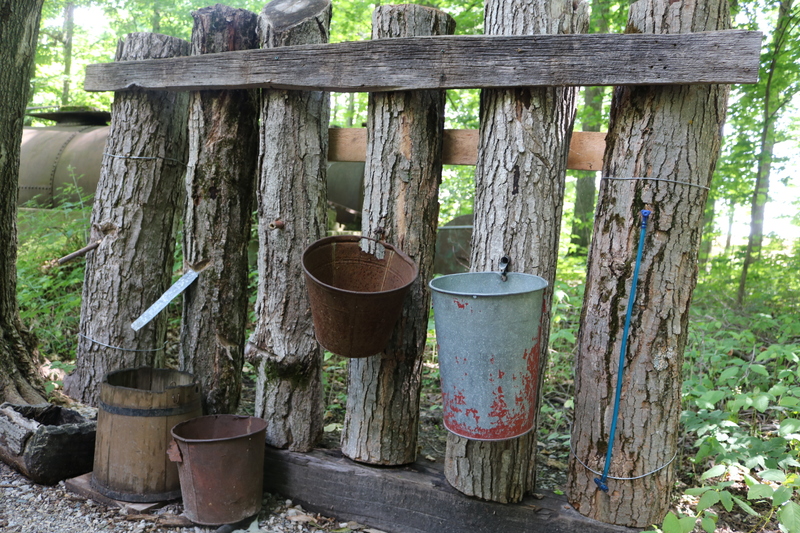 In the earlier days, buckets were used to collect the sap. The sap is then boiled in huge boilers to produce the maple syrup. The sap has to be boiled the same day that it is harvested, so maple producers must keep steady fires going constantly to obtain good maple syrup. 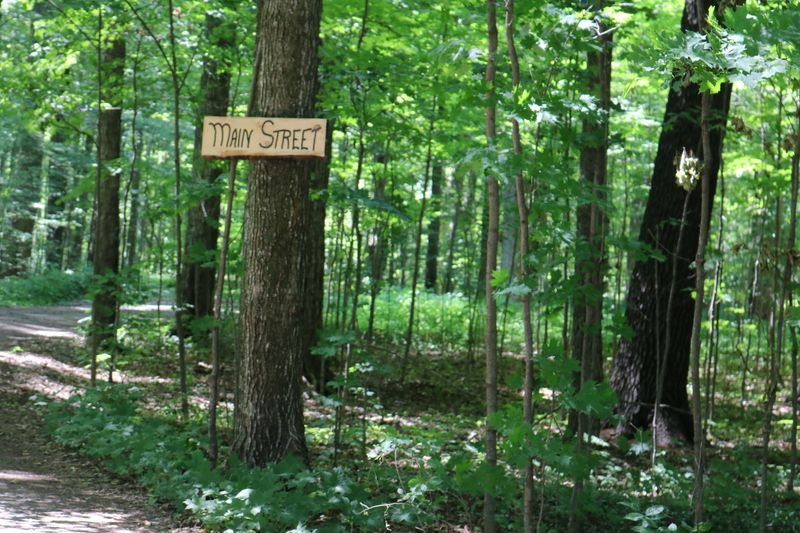 On average, it takes about 32 liters of maple sap to produce one liter of maple syrup. The visit to the Mennonite community was an interesting study for all of us and to see a close knit community in Canada still living under the age old traditions, customs and practices. new knowledge. i wish the entire world’s population was like them on the mother earth . Informative write up, thnx, sirji. It was interesting and well written. Nice to hear about the way they live.